Discussion in 'Article Discussion' started by Guest-16, 2 Mar 2010. AMDs newest chipset is the company's first major new design since 2007. It boasts integrated DX10.1 graphics with many HTPC features, native SATA 6Gbps support, and plenty of PCI-Express lanes - but might be missing the ability to unlock extra cores on certain Phenoms. Strange why there is no USB3.0 support. I am curious why AMD did not include this in the new chipset. the Southbridge offers support for it but why not intergrate it in the GX chipset. Weird. It's not. No USB 3 - only USB 2. All USB 3 is included via an NEC chipset. AMD gets its USB, like its SATA, from a third party. Mobo chipsets confuse the hell out of me. 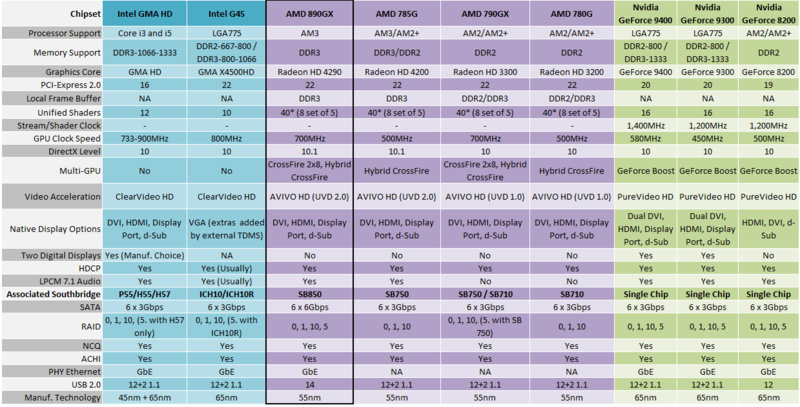 Is there s summery table anywhere of what makes each chipset different? What does that second pic on page 1 mean? Depending on the CPU you use you get the equivalent of different GPU products? I know that's not right, but it's certainly the impression it gives! It's just suggested pairings for a balanced system. Think of it like a 'serving suggestion' on a box of cereal! exactly what i've been waiting for, msi's matx 890GX is a beauty!!! What a massive dissapoinment this is. Its no mroe than an incremental upgrade, bascially a 785G+. They could have at least upped the GPU to come in a level whcih makes it more hybrid crossfire friendly! After all its basically a HD3200 boosted in the frist place. So now we have a HD 3200++ in there! And to think I got a 785G with the expectation of the next generation being somethign special lol. What a wasted opportunity. Computer vendors competed until there was only One True Way. Compaq, Tandem, Apollo, Altos, Burroughs, Sperry, Xerox, fell in. Now, all computers agree to not ask, not tell floating point errors. About 16bits of accuracy is good enough for government service. Sorry to bump such an old thread... but does anyone have experience with the AMD 890GX chipsets? The feature I'm most interested in is the ATI Hybrid Graphics Technology. How much of a performance boost does this give when used with a discrete graphics card? I'll probably use one Radeon HD 5870. It doesn't work with a HD 5870 sorry, it only works with a comparatively very low end card and even then, it's not great. Your only option with a HD 5870 is another HD 5870 in CrossFire. bindi, I tought another function is that it shuts down power hungry 'HD5870' video card when in desktop mode and switching to the low end on board. And when starting a game it steps up to the HD5870. That's a shame, would have been a great feature otherwise. Thanks for the info though! That's Nvidia Optimus that's only available on notebooks. The HD5800 series idles about 20W iirc - a fraction of its total power, so there's no need. ATI has never had desktop switching technology (it's working on it for notebook) although Nvidia tried it about 2 years ago with 9000 series that announced but never launched a manual switching system between Nvidia motherboard IGP and Nvidia GPU. Nvidia chipsets went in the ******* soon after and it never actually materialised on the market, despite being one of the very few reasons to buy a 9000 series card over 8000.